1) The Band of ?Psycho Chicken?. 2) Mark Gunnery (of the Riot-Folk collective) and Mahra Parian. 3) Japanese R&R Band.Check also ????. (1) The Fools Story By Hugh Jarse Sometime around 1975, deep in the Home of the Fried Clam, Ipswich, Massachusetts, a really fun bunch of guys who had a band called "The Rhythm A's" somehow changed and became The Fools. This is their story. All entertainers have a gimmick, a shtick, if you will (even if you won't). 2) Mark Gunnery (of the Riot-Folk collective) and Mahra Parian. 3) Japanese R&R Band.Check also ????. Sometime around 1975, deep in the Home of the Fried Clam, Ipswich, Massachusetts, a really fun bunch of guys who had a band called "The Rhythm A's" somehow changed and became The Fools. This is their story. All entertainers have a gimmick, a shtick, if you will (even if you won't). The object of a Fools show was to blow real life out of all proportion and morph ?just another night out to see a band' into the most fun anyone had ever had ? anywhere! Meeting with great success, it wasn't long before the lads were masterminding stage trickery, pratfalls, skits, themes, twisted audience participation, practical jokes, paybacks, big nights and even some colossal events. Then they discovered radio. In 1979 "Psycho Chicken," X-rated parody of The Talking Heads' "Psycho Killer," exploded over the airwaves of Boston. The boys were so excited they followed up almost at once with another whopping hit ? "It's a Night for Beautiful Girls." And the guys weren't the only ones to get excited. 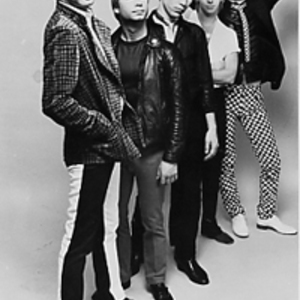 EMI Records signed the band and sent them right out to tour the U.S. with The Knack. The tour was a smashing success. Then, off to Miami to record the victorious debut album "Sold Out." Record-breaking radio airplay, new videos with heavy MTV play, new releases and constant touring propelled The Fools through the mid-1990's. Now in the new millenium they're at it again. Do not miss an opportunity to experience the spectacle and splendor, the legendary bombast, yes the shock and the awe ? The Fools! Who Have To Fools Played With ?...Heres just a few according to Rich Bartlett ! You know, I was looking at the web site and saw all those bands you guys played with ! VERY impressive ! If you want to add a few local band names to the list, here's what I got ! In August of "76 ( that's right,I was 5 years old ) yoos guys played at the Twin Rinks on 114 in Danvers with : " Hot To Trot ", "Cloud ", " Voyage " and " Blue Moon " ( My second band with Paul Bonaiuto and Mike Shea )! Let's not forget the many times we played together when Sadler and I had "The Carmody Band " ! Gigs at the Summit Club,The Main Act ( Harbor House ) and I believe the Paradise ( though I'm not too sure about THAT one, I know we played with " The Stompers " and " Private Lightning" a couple of times) I'm sure you're getting inundated with "has beens" trying to re-fresh your memory of those legendary bygone days and I won't take-up any more of your time ! It's not that IMPORTANT to me! (2) The Fools are Mark Gunnery (of the Riot-Folk collective) and Mahra Parian. Their S/T (2006) album was recorded in Mark's bedroom in Berkeley in fall and winter, 2006. The CD has a twenty page booklet full of foolish lyrics, art and writings. They have toured parts of the USA and Canada. They are currently working on a zine/CD combo, no release date as of yet.